Image above: The Atlas V rocket with the Solar Dynamics Observatory aboard lifts off from Cape Canaveral Air Force Station in Florida. 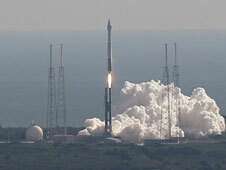 NASA’s Solar Dynamics Observatory, or SDO, launched at 10:23:00 a.m. EST aboard a United Launch Alliance Atlas V rocket from Launch Complex 41 at Cape Canaveral Air Force Station, Fla. The spacecraft separated from its launch vehicle on-time after a flawless climb into orbit. 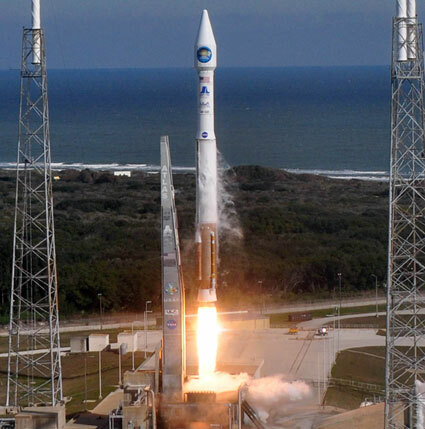 A United Launch Alliance Atlas V with its Centaur upper stage pushed the 6,800-pound Solar Dynamics Observatory into an orbit 22,300 miles above Earth. 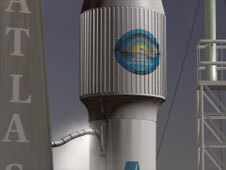 The Atlas V made its first flight in 2002.